The aim of this paper is twofold: to provide a theoretical framework and to give further empirical support to Shiller’s test of the appropriateness of prices in the stock market based on the Cyclically Adjusted Price Earnings (CAPE) ratio. 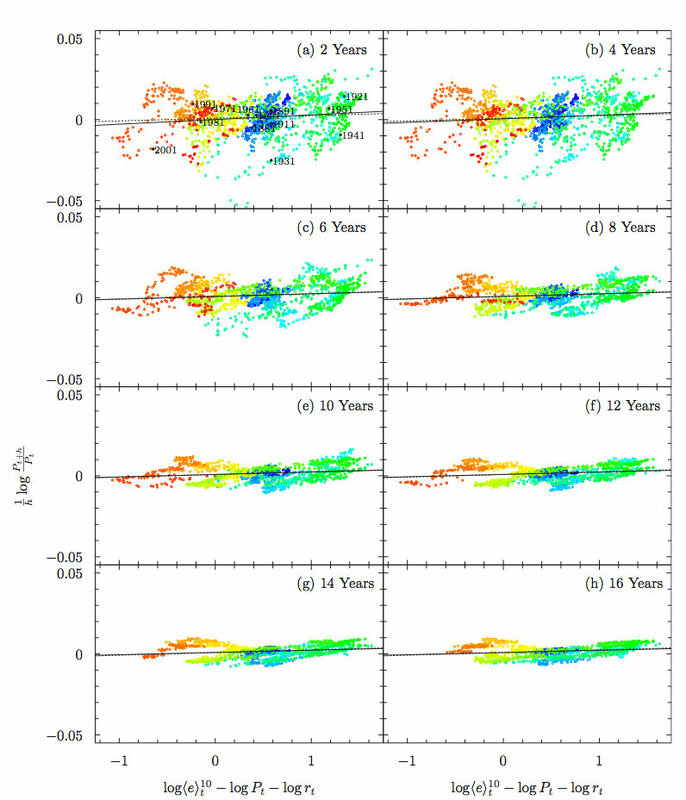 We devote the first part of the paper to the empirical analysis and we show that the CAPE is a powerful predictor of future long run performances of the market not only for the U.S. but also for countries such us Belgium, France, Germany, Japan, the Netherlands, Norway, Sweden and Switzerland. We show four relevant empirical facts: i) the striking ability of the logarithmic averaged earning over price ratio to predict returns of the index, with an R squared which increases with the time horizon, ii) how this evidence increases switching from returns to gross returns, iii) moving over different time horizons, the regression coefficients are constant in a statistically robust way, and iv) the poorness of the prediction when the precursor is adjusted with long term interest rate. In the second part we provide a theoretical justification of the empirical observations. Indeed we propose a simple model of the price dynamics in which the return growth depends on three components: a) a momentum component, naturally justified in terms of agents’ belief that expected returns are higher in bullish markets than in bearish ones; b) a fundamental component proportional to the log earnings over price ratio at time zero. 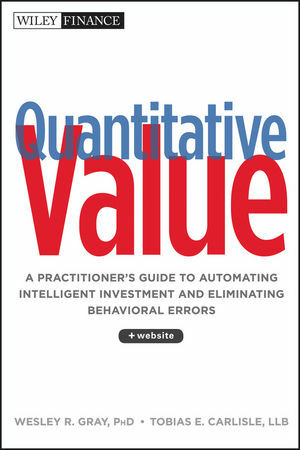 The initial value of the ratio determines the reference growth level, from which the actual stock price may deviate as an effect of random external disturbances, and c) a driving component ensuring the diffusive behaviour of stock prices. Under these assumptions, we are able to prove that, if we consider a sufficiently large number of periods, the expected rate of return and the expected gross return are linear in the initial time value of the log earnings over price ratio, and their variance goes to zero with rate of convergence equal to minus one. Ultimately this means that, in our model, the stock prices dynamics may generate bubbles and crashes in the short and medium run, whereas for future long-term returns the valuation ratio remains a good predictor. • For all developed equity markets the expected real return in local currencies is positive and the probability of negative real returns after ten years is generally low. 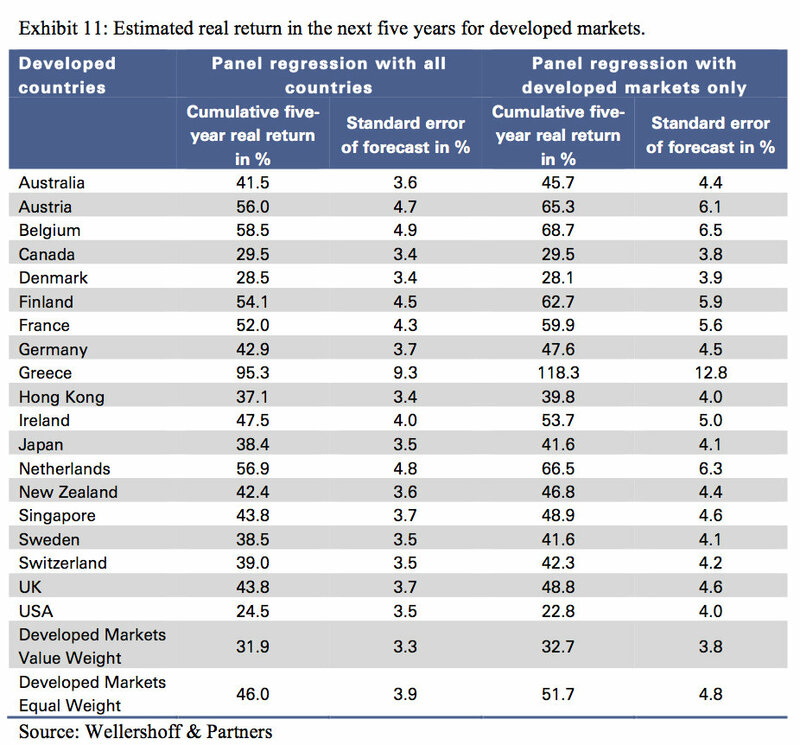 • The market with the lowest expected future return is the United States which together with Canada and Denmark promises real returns that are quite a bit lower than developed markets overall. • Because of the low expected returns for US stock markets, an equal weighted portfolio of developed market equities is expected to perform significantly better than a typical value weighted portfolio. The current debate about optimal sector and country weights in a stock market index is still ongoing and there are many different rivaling approaches like equal weighting, fundamental weighting, GDP-weighting or equal risk contribution or minimum variance. The jury is still out which one of these approaches is the best for long-term investors, but our calculations indicate that an equal weighted portfolio should outperform a value weighted one. • Looking at individual markets again, we see that the most attractive markets are generally the crisis-ridden European equity markets and in particular Greece which currently has such low valuations that real returns over the next five years could come close to 100%. But more stable markets like Finland, France or Germany also offer attractive long-term return possibilities. • Emerging market equities seem to be poised for significantly lower real returns than developed equities at the moment. • Particularly smaller emerging countries like Peru, Colombia or Indonesia offer less attractive returns at the moment than more developed neighbors like Brazil or Thailand. 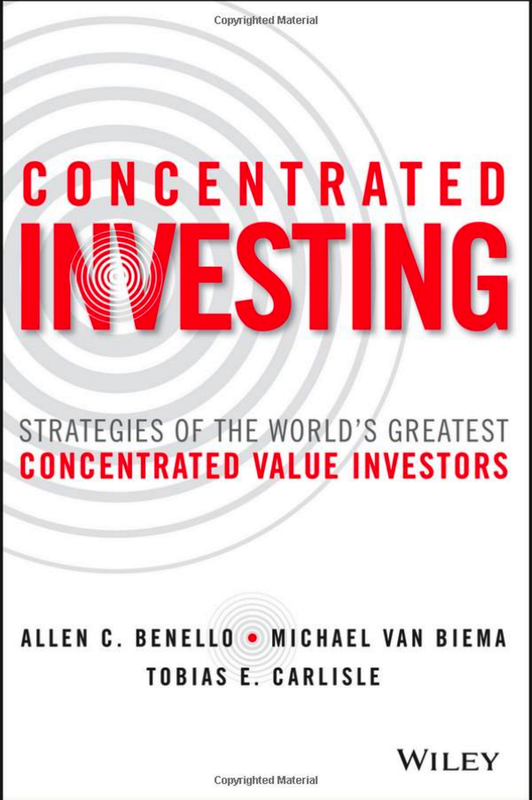 • Some currently fashionable investment countries like China or India offer only average return prospects. • From a regional perspective it seems that Eastern European countries together with Turkey and South Africa offer the highest future equity markets while Asia overall should be only average and in Latin America only Brazil seems a worthwhile investment at the moment. Is something wrong with the link to the first paper? The paper the link sends me to deals only with the US, not international markets at all. It’s the same title, but the abstract isn’t remotely close. I am not an investing expert but agree that Brasil and China followed by India are a good investments. I also have have a lot of faith in North American’s economy. Hey guys….. look at the economy of a good Poland. Constrains, to the point, is the way to go. Control your spending, for now I will buy some properties in Florida. And if you decide to follow me, get the green card. Unfortunately, the latter analysis only uses data back to 1990, when developed markets were already expensive. For an analysis of U.S. market valuations and return implications back to 1927, see our Estimating Future Returns piece. 1…the Cyclically Adjusted Price Earnings Ratio is a powerful predictor of future long run performances of the market not only for the U.S. but also for countries such us Belgium, France, Germany, Japan, the Netherlands, Norway, Sweden and Switzerland. 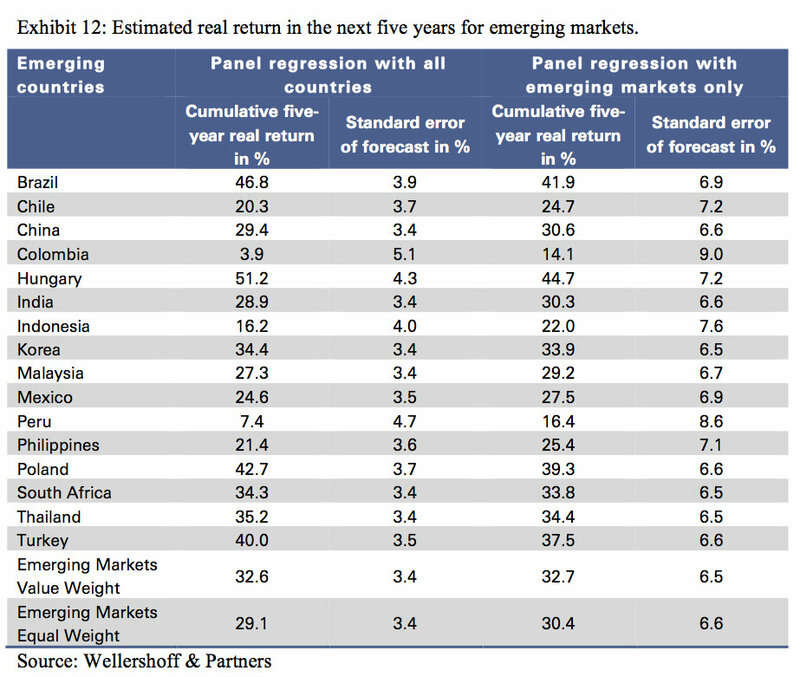 2….CAPE is a reliable long-term valuation indicator for developed and emerging markets. Greece is seen to double in 5 years?